Inside the Terror Factory, Trevor Aaronson, 1/11, Mother Jones. FBI Sting Operations: Fair or Entrapment, interview with Trevor Aaronson, 1/11, CBS This Morning. 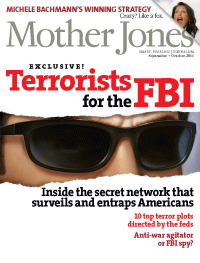 Cover of the September/October 2011 issue of Mother Jones in which Aaronson's story, "The Informants" was featured. Schuster Institute > Government & Corporate Wrongdoing > Catching or Creating Terrorists? 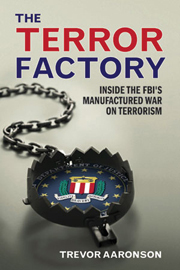 In "The Terror Factory: Inside the FBI’s Manufactured War on Terrorism" (Ig Publishing, January 15, 2013), Schuster Institute Senior Fellow Trevor Aaronson analyzed more than 500 federal terrorism prosecutions over ten years and found reason to question whether U.S. law enforcement is actually creating the very enemy we fear. Aaronson found that the Federal Bureau of Investigation has, "under the guise of engaging in counterterrorism since 9/11, built a network of more than 15,000 informants to infiltrate Muslim communities and ferret out would-be terrorists. The Bureau then provides the means necessary for these would-be terrorists to move forward with a terrorist plot—in some cases even planting specific ideas for attacks." "The FBI spends $3 billion every year on counterterrorism, more than it spends on organized crime," says Aaronson. "Some of their counterterrorism activities involve years-long sting operations, and informants working them can receive $100,000 or more for their work." Aaronson reports that through these elaborate and expensive sting operations involving informants and undercover agents posing as terrorists, the FBI has arrested—and the U.S. Justice Department has prosecuted—dozens of men who government officials say posed terrorist threats. He says evidence suggests, however, that some of those under FBI scrutiny did not have the capacity for terrorism were it not for FBI undercover agents providing the means, including weapons and logistical support. During his period of investigation, Aaronson says he "gained extraordinary access to the high-ranking FBI officials who were in charge of transforming the FBI from a law enforcement organization into an intelligence agency focused on ferreting out who they thought were would-be terrorists." 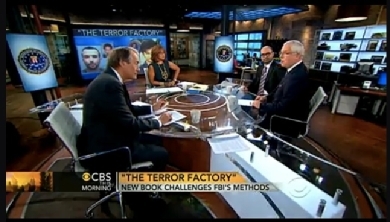 In advance of the launch of his new book, Aaronson was interviewed with former FBI Assistant Director John Miller on CBS This Morning with Charlie Rose, January 11, 2013. Following a post-9/11 presidential mandate to increase human intelligence, the number of FBI informants swelled to 15,000, according to FBI sources. The increase in informants was so dramatic that the FBI created a new software package to help track and manage its army of snitches. On January 15 in a Portland, Oregon federal courthouse, a trial begins against Mohamed Osman Mohamud who the FBI accuses of trying to detonate a car bomb at the Pioneer Courthouse Square Christmas-tree lighting ceremony in 2010. Mohamud is one of more than 150 defendants caught in recent FBI terrorism sting operations. “The FBI believed that Mohamud had tried, but failed, to contact terrorists in Pakistan by email. An FBI informant then emailed Mohamud, pretending to be part of the terrorist group he’d reportedly been trying to reach, claiming to have received Mohamud’s email address from the man he was trying to contact in Pakistan. The email read, in part and in all lowercase letters: ’sorry for the delay in our communication, we’ve been on the move… are you still able to help the brothers? “The Terror Factory” is an outgrowth of work Aaronson did while an Investigative Reporting Fellow at University of California Berkeley's Graduate School of Journalism in 2010-11. There, he researched and reported on this topic; those efforts culminated in the publication of “The Informants,” his September/October 2011 cover story in Mother Jones for which the magazine received an international Data Journalism Award for the investigation. (Here are the story’s interactive database and accompanying data graphic displays.) In “Behind the Story: MoJo’s Investigation of Terrorism Informants,” Aaronson describes how he did his reporting. Aaronson earned four individual awards for this story—the Molly Prize, a John Jay Criminal Justice Reporting Award, a Western Publications Association Maggie Award, and an award from the Society of Professional Journalists’ Northern California chapter. He was also named as a finalist for the Livingston Awards, which recognize journalists under the age of 35. Since his first article, Aaronson has discussed the Bureau’s controversial counterterrorism tactics on a wide array of news programs, including NPR’s All Things Considered, C-SPAN’s Washington Journal, This American Life, Democracy Now!, RT America, and Al Jazeera Americas, among others. Upcoming Events: Trevor Aaronson talks about "The Terror Factory"
Visit Aaronson's website for additional appearances.